What a pair of beauties: Two wooden phone booths with hinged doors that close all the way and stools to relax on while you make your call. In the left booth, a light even goes on when you shut the door. They’re at Montero’s, the divey but warm Brooklyn bar at the river end of Atlantic Avenue. The bartender said they were there when the place opened in this spot in 1947. 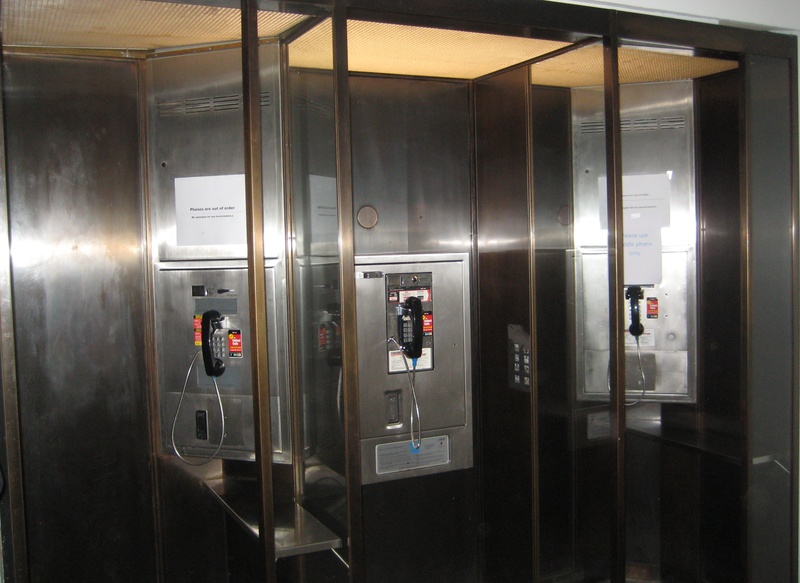 This row of phone booths, in the basement of the Whitney Museum, isn’t made of wood. But they are actual booths, which is pretty rare these days, and worth noting. I have no idea when they date to, but it’s from a time when museum directors had no idea the cell phone era was on its way. 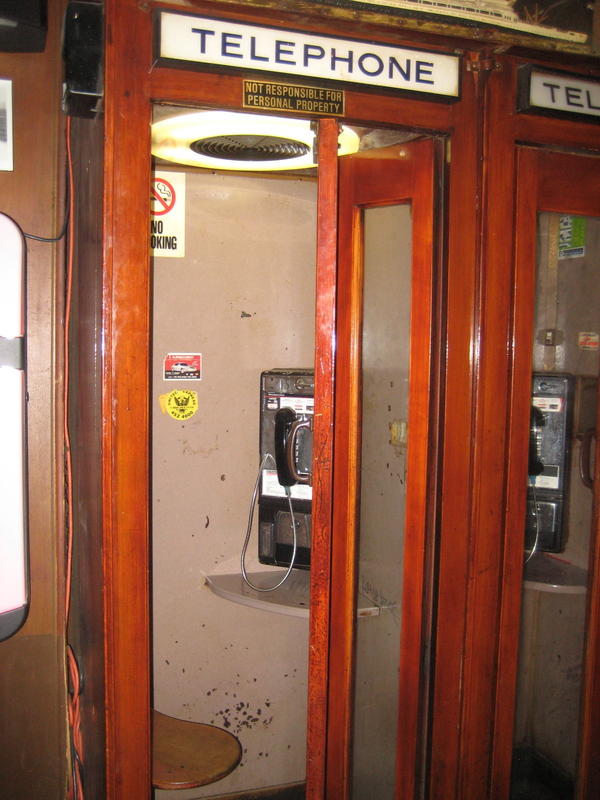 Check out more examples of the phone booths still holding on around the city. This entry was posted on March 22, 2012 at 4:58 am and is filed under Brooklyn, Upper East Side. You can follow any responses to this entry through the RSS 2.0 feed. You can leave a response, or trackback from your own site. Ahh, a time when people actually conducted their telephone conversations in a place where there was quiet and they weren’t inflicting their conversation on everyone else. I hate cell phones. And I do love those phone booths! I’m pretty sure there are still phone booths outside – on the street corner! – on West End Avenue in the lower 90s, say 93rd if I recall. Booth and all. Around 1975, I had the extreme privilege of visiting the throne of a workingman’s aka dive bar right near the old Drake theatre on Woodhaven Blvd. in Queens. The folding wood door with plexiglass? was intact but the seat was an untidy bowl – in full view of everyone. Can’t say if the door zipped shut, but at least I didn’t attempt to do the opposite. Class acts like that need no encore.